Permafrost soils store large quantities of frozen carbon and play an important role in regulating Earth's climate. In a study published in Nature Geoscience, researchers from Umeå University, Sweden, in collaboration with an international team, now show that river greenhouse gas emissions rise high in areas where Siberian permafrost is actively thawing. As permafrost degrades, previously frozen carbon can end up in streams and rivers where it will be processed and emitted as greenhouse gases from the water surface directly into the atmosphere. 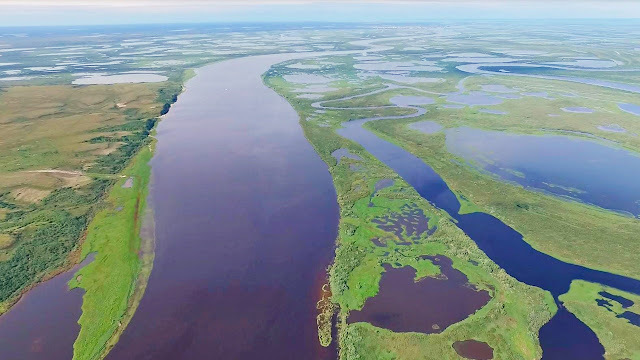 Quantifying these river greenhouse gas emissions is particularly important in Western Siberia - an area that stores vast amounts of permafrost carbon and is a home to the Arctic's largest watershed, Ob' River. "This was an unexpected finding as it means that Western Siberian rivers actively process and release large part of the carbon they receive from degrading permafrost and that the magnitude of these emissions might increase as climate continues to warm" says Svetlana Serikova, doctoral student in the Department of Ecology and Environmental sciences, Umeå University, and one of the researchers in the team. "The large-scale changes that take place in the Arctic due to warming exert a strong influence on the climate system and have far-reaching consequences for the rest of the world. That is why it is important we focus on capturing how climate warming affects the Arctic now before these dramatic changes happen" says Svetlana Serikova.